India witnessed a jump in the number of operational farmlands between 2010-11 and 2015-16, but the same period also saw the average size of these land holdings and the area they cover take a dip, shows the provisional Agriculture Census released by the Ministry of Agriculture and Farmers Welfare. The total number of operational holdings in the country increased from 138 million in 2010-11 to 146 million in 2015-16, which is a 5.33 per cent growth. But the average of size of these holdings went down to 1.08 hectares (ha) from 1.15 ha in 2010-11. 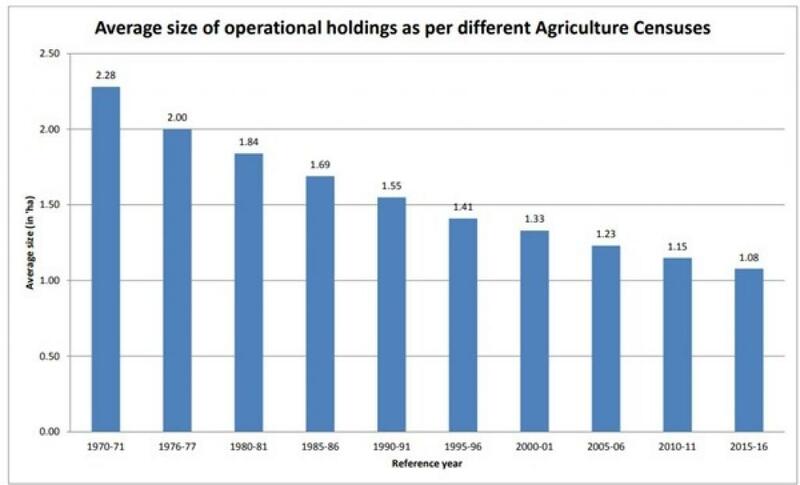 Also, the area of operational Indian farmlands, the holdings which are partially or wholly used for agriculture, reduced from 159.59 million ha in 2010-11 to 157.14 million ha in 2015-16, which is a decrease of 1.53%. 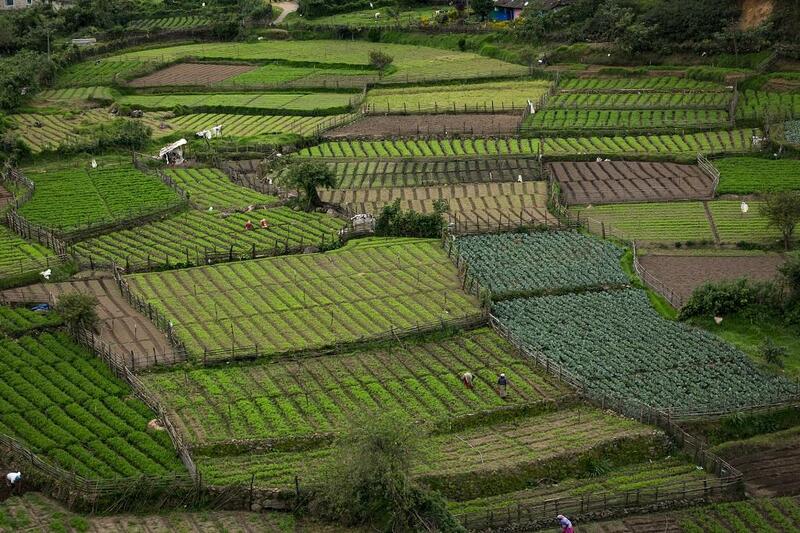 In fact, a closer look at the government report shows that the decrease in average size of farmlands has been the most in Goa (28.9 per cent), followed by Sikkim (20.4%). In Goa, it’s the small and marginal farmers who have been most involved in this land fragmentation as the average size of land they possess has registered a decrease of 55.44 per cent. Similarly, in Sikkim, the maximum decrease in the size of operational holdings has been found to be amongst farmers that have medium-size land pieces, the average size of which has reduced by 57.69 per cent in five years. Inheritance of land from generation to generation has been a major reason behind this. Nelson Figueiredo, Goa’s agriculture director, had reportedly also said that the land holdings in the state were highly fragmented as they get divided between heirs in every few decades. The state’s fertile Khazan lands have also been affected due to short-sighted planning, public apathy, industrialisation and urbanisation. The land holdings are now being gobbled up for infrastructure development. Khazand lands are reclaimed lands from the river or the sea. A created network of bunds protects the agricultural fields and adjoining villages from tidal flows. Hence, their destruction affects the farmlands. Another factor that earns Goa a lot of money and could also be causing land fragmentation is tourism. Goans are not only selling, converting or renting their old houses, but also land holding for commercial and residential purposes. In 2017, 77.85 lakh tourists came to Goa, which was a 22 per cent increase from the previous year. In the last 32 years, the number of tourists coming to Goa has increased nine times and so have the number of hotels between 2005 and 2017. Around 4,000 hotels came up in these 12 years. Growth of the construction sector has also attributed to land fragmentation here. The contribution of the construction sector to the state GDP has risen by a phenomenal 136 per cent—from Rs 1,313 crore to Rs 3,098 crore between 2004 and 2014. This is twice the size of Goa’s agricultural economy. Goa is home to the largest urban population among all the small states in India. More than 62 per cent of its population resides in urban areas and about 38 per cent in rural areas, says the 2011 census. As per the 1961 census, 85 per cent lived in rural areas and 15 per cent in urban areas. This increase in urban population has also put pressure on agricultural land. In fact, environmentalists had objected to the Goa's Town & Country Planning Act, amended in 2016, as it allowed eco-tourism activities inside ecologically sensitive zones. Environmental lawyer Ritwik Dutta feared that the amendment will lead to a rush of people converting agricultural land. Now, the town planning law approved three months, paves the way for individual change of land use in the coastal state. The Town and Country Planning Amendment Bill, 2018, restores the system of approving individual change of land use that was the norm in Goa from 1996 to 2005. According to the Town and Country Planning minister Vijai Sardesai, this bill is expected to help a large number of land owners seek re-classification of their lands for settlement use (allowing construction on them) from state authorities. Such lands were in 2011 classified as orchards or agricultural fields under the Regional Plan (RP) 2021, barring any construction on them. Fragmentation of holdings is one of the main causes of low agricultural productivity as a lot of time and labour is wasted in moving seeds, manure, implements and cattle from one piece of land to the other. This problem has been acknowledged by the government’s report on doubling farmers’ income too. The report had strongly recommended that holdings be consolidated, which means reallocation of fragmented farmlands. A paper published in the journal Economic and Political Weekly also recently raised this issue by saying that farmers who are unwilling to sell such non-viable land holdings, should be free to lease out tiny holdings to another farmer who can consolidate them and pay a fair rent. The Niti Aayog too had advocated for reforms in land leasing laws, so that the operational land holding could be consolidated to raise the level of prosperity of the workforce dependent on agriculture. It had also proposed a model land leasing Act which the states can adopt to frame law as per their needs. Suggestions are in place, implementation is missing.